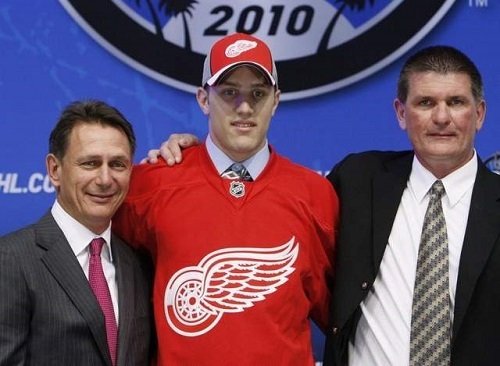 Ken Holland is often criticized for what a lot of people deem “over-seasoning” of young players. By “over-seasoning,” they mean keeping prospects in the American Hockey League so long that they over-ripen in their minds. Red Wings fans have been lucky to have a team that has made the playoffs for 22 consecutive seasons, even after losing some of the best players who have ever played the game. Having to transition after the retirements of the previous two captains Steve Yzerman and Nicklas Lidstrom is no easy task. Many teams would likely have just started to pick apart the roster and begin a complete rebuild if such a shift were to occur. Teams that undergo a complete rebuild are basically acknowledging the fact that they won’t be a competitive team playoff-wise for at least another three or four years. Fans in those markets must patiently wait for the year that their team resembles a contender, and no one ever has a sure-fire answer. Here in Detroit, no one born in the year 1990 or after has ever seen this team fail to qualify for the post-season. It’s the longest streak in the NHL, and it’s the longest streak in any of the four major sports. Many people take it for granted, and see an early playoff exit as a failed season. Management in Hockeytown has been able to keep the team afloat through thick and thin. Just this past season, the consensus thought was that Detroit had no shot at finishing in the Top 8 in the West. That same team came within a single goal of eliminating the eventual Stanley Cup champion Chicago Blackhawks. Ken Holland started out as a scout in Western Canada. He later served seven years as their Director of Amateur Scouting and three as Assistant General Manager. He has been the General Manager, Executive Vice President and Alternate Governor since the summer of 1997, and the results have shown nothing but success. Three Stanley Cups, four Presidents’ Trophies and eight Division titles have been won with him at the helm. This afternoon, at the Red Wings Development Camp, I had the opportunity to speak with him about player development in general, and the process that must be put into place to insure future success in the organization. After reading about his explanation of the process, I think Red Wings fans will have a better understanding of why players spend so much time in the minors, and also a better appreciation of the great leadership and management that Detroit’s front office has shown. “…We picked 18th this year. That’s the highest we’ve picked in 20 years, so we’re not picking the best players that are available. Our players that we select are deeper in the draft for a variety of reasons. One of which is that they’re not ready to play. They need to get stronger. They need to get better. They need to develop as people and as players, so we’re about that process. We don’t have a large window of time to watch [these prospects] play so this is a good week because all the focus of our people is on these kids. When we go to Traverse City in September and the vets show up, we’re going to be worried about Jimmy Howard, and Pavel Datsyuk…and Daniel Alfredsson. So right now, it’s about education. Some of these players won’t play in Detroit for six years. It’s a process. After this, then the process is to go home, and hit the gym, and then some of them will go to a world junior camp, and then it’s to come back in September and play in the prospect tournament. Then they go back to their league and hopefully put all of the experience and knowledge to work. But it’s a long, long…long process. We drafted Jakub Kindl in 2005. This is 2013, and just this past year, he was a regular for the first time. It’s hard to make the NHL. They’ve all got good resumes, and that’s great, but the NHL is a hard league to make. It’s the best men’s league in the world and we want to win. We can put these kids in the NHL, but we’re going to lose if they play in the NHL now. We want to win. They need to learn how to check. They need to learn how to hit the gym. They need to learn how to be pros. They need experience. This is part of that process. The Detroit Red Wings raced people along in the 80s. Doug Houda played in the NHL at the age of 19, and at the age of 20 he was back in the American league. Steve Yzerman played in the NHL at the age of 19. We’ve got our program going. We took the 80s and half of the 90s to get it going. Fortunately we’ve been able to keep it going. If you look at some other teams, they go for a while, then [they] go back and pick high [in the draft]. We’re trying to be a playoff team, but behind the scenes, we’re trying to develop, and the guide and record book says it’s hard to do. We’ve been in the playoffs 22 consecutive years, and our goal is to make it 23 consecutive years. It’s a hard league. It’s hard to make the playoffs. It’s hard to win a game. People don’t understand how competitive…these are the 30 best managers, coaches, chief scouts in the world, that anybody can find, and we’re all competing, and ultimately you win by a goal or you lose by a goal. It’s close. Gustav Nyquist is just getting to the NHL. He was the leading scorer in college hockey as a sophomore. He was fourth leading scorer as a junior. He was in the top 10 scoring in the American league as a rookie. He was leading the league in scoring when we called him up. He gets to the NHL, and it starts all over again. Now he’s got to fight for ice time in the NHL. I guess what I’m trying to stress is how hard the league is. I quantify winning as making the playoffs. I quantify winning as having a chance, if things go right, to go on a playoff run. We can put 20 guys or whoever we want in the jersey and we could lose every night, and you can say they’re NHL players. I don’t call that a good program. Hopefully that clears up any questions you may have about the way Detroit runs its development program. Detroit fans have to be patient. Next season new defensemen such as Ryan Sproul and Xavier Ouellet will be joining the ranks of the Grand Rapids Griffins (among other players). The future is looking very bright in Detroit, and experience will certainly pay off soon with these future stars. If you take a second to think about it, it all makes sense. Although many of you want to see a player like First Round Draft Pick Anthony Mantha join the Wings next season, the truth of the matter is, he’s not ready. The NHL IS the hardest hockey league in the world to play in and you have to make sure a player is fully (or almost fully) developed in all areas of his game before you throw him into it. This same process has been used every year by Holland, even on star players such as Datsyuk and Zetterberg. As they say, patience pays off, and history has proven that.